Oldenhammer in Toronto: How many miniatures can you paint in a year? How many miniatures can you paint in a year? Breaking down these numbers, that's about 3 miniatures a week... not bad, I suppose, given how slowly I paint. I can only guess what the average number of hours I spend on each miniature... but I reckon it has to be at least 4 hours per figure. In other words, I've spent about 644 hours painting this year. Since there's about 6000 waking hours in each year, that means I've devoted over 10% of 2015 to brushwork. Is this a good use of time? Let's ask 17th century mathematician and philosopher Blaise Pascal. Pascal: "God wants you to paint miniatures." Pascal is famous for writing that all humans wager with their lives that either God exists or he does not exist. Based on the assumption that there is at least a small probability that God exists, Pascal argued that a rational person should live as though God exists. That's because if God does not exist, such a person suffers only marginal losses (such as genuflection related injuries). But on the other hand, a pious person sets himself up for infinite gains if God does indeed exist. Sounds reasonable! 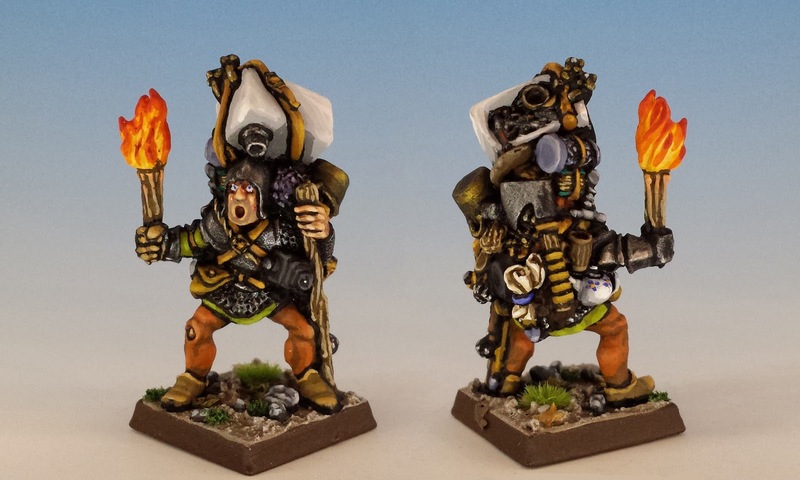 And it seems to me that if God exists, there is also a very small chance that He wants us all to devote at least 10% of our lives to painting vintage miniatures (and will punish us with hellfire if we slack off). The logic is iron-clad. And therefore, my life is on the right track. The accomplishment that gives me the most satisfaction is finishing the complete set of Talisman miniatures. Sometimes, when other aspects of my life depress me, I try to cheer myself up with the thought "yes things may be terrible, but at least I have painted a complete set of vintage Talisman miniatures." Oddly, this mantra works. The most challenging paint-jobs in 2015 have been the Star Wars Imperial Assault. Trying to accurately represent the characters I love so well has been nerve-wracking. 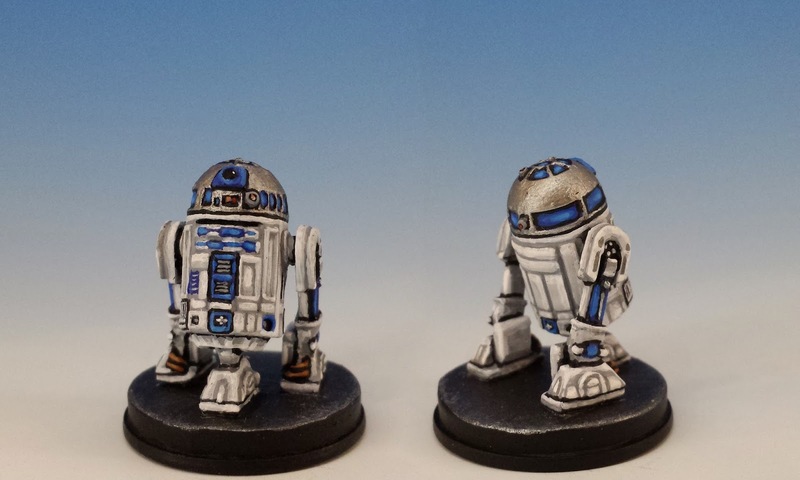 The one that took the most effort was R2-D2 -- the geometric patterns of his trunk seem so simple but the details seem to carry so much of his personality. But what has truly brought me pleasure is the wonderful community I've discovered online. I can say with complete sincerity that every follower and (especially) every comment left on this site brightened 2015 for me. And to discover so many other great websites and people has been a revelation... So thanks for visiting, and I hope you have a wonderful New Year! I don't keep track...yet...but I would say my out put for this year was in the 150-175 range. Very interesting stats though. ;) I really enjoy seeing updates on your blog, looking forward to what 2016 brings for all of the Oldhammer community. I'm glad to hear that you enjoy the blog, ABG! SPOILER ALERT: 2016 should bring vintage Lord of the Rings miniatures, more Imperial Assault, the conclusion of the read-along Fellowship of the Ring, and a long-contemplated analysis of Jewish Citadel miniatures (maybe for Passover 2016). 10% of ones waking hours? You've re-invented tithing, it seems. My own miniature-total falls short of yours. Well short. Pascal (to say nothing of The Almighty) would be displeased. Yes, tithing! Krom demands a tithe! Painted Lead for the Painted Lead God! From what I can work out I painted 136 figures this year. Not too bad but I would like to get up around 200 - maybe a challenge for 2016! Going from 136 to 200 is a huge increase. Good luck! I'm looking forward to seeing the results. Fantastic year of blogging! For me, point of inspiration! I'm always amazed by your own painting - and your bilingual blog posts! If English is not your first language, you certainly write as though it is. Haven't kept track of my own output though. Not sure I'd like the results! Wow! 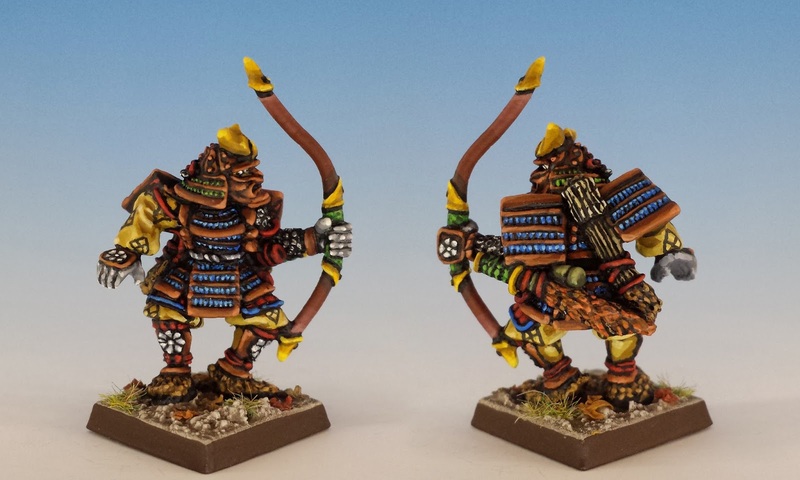 That Talisman Samurai is absolutely excellent! And I quite agree about the wonderful community that we have online, with all its myriad ways and wants. In fact, your little run down of you hobby year has inspired me to do one of my own, as I am a bit in the doldrums at the moments. So thank you! I'm sorry to hear that you're feeling blue, OJ. Normally, I am pretty run down myself at this time of year, but oddly the weather here in Toronto has been warm and fairly sunny. Anyway, I just went to your site to check out your own review of 2016... and what do I find there but a lovely paragraph or two about Oldenhammer in Toronto. Thank you sir! Your analysis of my painting was very gratifying (an accurate description of my technique too: I generally undercoat black, and always work up the colours. I don't generally use washes, although lately I've been trying to improve my glazing). Anyway, your blog always brings me a lot of pleasure! I have been keeping track using a points system first devised by lonepilgrim (http://lonepilgrimredux.blogspot.com/2008/12/painting-points-mean-prizes.html) since 2009. Bar the early years when I was getting back into the hobby and thus was painting a lot to get enough complete for gaming, 100 points is pretty much the target. I am impressed with the amount of painting you get done to that level, not all of my stuff is painted so nicely. I like that point tracking system - it makes a lot of sense. Cavalry always takes me forever to paint. I was just looking at your Black Knights. They look amazing -- very intimidating. Yes, though I feel the scenery for necromunda in a box garnered me more points than the effort entailed. I'm considering splitting scenery/terrain out, or at least keeping track of actual miniatures as well. Looking at it that way I still painted over 100 points of miniatures this year which hit my target. Plus a converted 28mm shuttle/lander and a 3x4' game board for Frostgrave... 312 miniatures... Hmmm... Exactly 6 models per week. Still less than more normal output. ... than MY normal output. Considering the top notch quality of your work, I am astounded at your output. I always assumed that most of the content on your blog came from a huge backlog of miniatures painted over years or decades. I'll be jiggered. Hats off to you. Just came across your blog today. I like the shine on R2's dome. Well done, all around. I seem to be a perfectionist and have a hard time calling any project "finished," plus I have five small children at home. I would estimate that I painted about 20-25 figures this year to a mostly playable tabletop standard (not all are complete) from Bolt Action, LOTR SBG, Warhammer, and Battletech. I also started a blog earlier in the year, but have just tried to get it going this month. Feel free to stop by if you like: http://ajburgoyne05.blogspot.com/. Perhaps that's shameless self-promotion? If so, then I hope it's not too offensive. Happy New Year! Welcome to the blogging world, Andrew! Your site looks most promising... I was happy to see some Battletech miniatures there - I hope to see more. I love those minis, and hope to get some photos of my own up soon. Happy New Year! That samurai is ACE! Such a lovely job and a great way to road out your talisman collection. You really outdid yourself iver150 painted and based and lavished with attention figures. Incredible, way to show the new world what the Canucks can get up to. You tell no lies about the Man-Mangler. It is an army killer. I loved the Holy Grail picture on your website. Looking forward to our next get together (and discussing The Force Awakens, which I think I liked better than you). Exactly 259 figs painted in 2015.